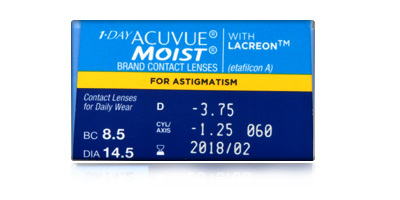 From trusted brand Johnson & Johnson, 1 Day Acuvue Moist for Astigmatism lenses are toric daily disposables designed for comfortable all-day wear. They supply the same quality of vision as glasses and the freedom of a high quality, durable lens. You get the best of both worlds. Sophisticated technology is at the core of Johnson & Johnson 1 Day Acuvue for Astigmatism lenses. These daily disposables feature the company's patented Accelerated Stabilisation Design. This is a four-pronged system which utilises the eye's natural blink to secure the lens in position on the eye all day long. Whilst lower quality, flimsy lenses often slip out of position, these stay put from the time of application until the moment you remove them. 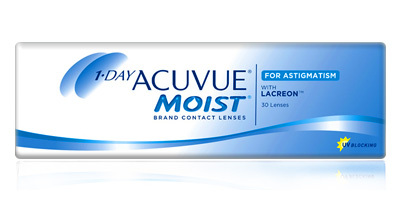 1 Day Acuvue Moist for Astigmatism toric contact lenses also feature the moisture-rich ingredient Laceron, which locks moisture in all day. They're easy to handle, apply and remove, thanks to a simple but essential inside-out mark. 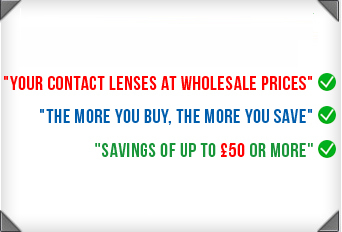 No more fiddling around or discomfort trying to work out which way your lenses should be applied! Many lenses offer around 50% UV protection. 1 Day Acuvue Moist for Astigmatism toric daily disposables raise the bar by supplying 70% UV-A blocking and an impressive 95% UV-B blocking. Your eyes will be comfortable and protected against the potentially harmful effects of the sun's rays. 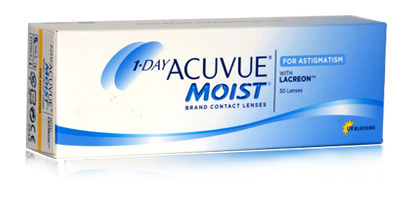 Place an order for 1 Day Acuvue Moist for Astigmatism lenses with us and get express delivery to your doorstep. 98% of orders are usually despatched on the same day as placement.